Innovation is on the rise in Allston. In 2020, a little more than half of the John A. Paulson School of Engineering and Applied Sciences (SEAS) will relocate into Harvard’s new Science and Engineering Complex (SEC), currently stretching skyward in Boston’s Allston neighborhood. From cutting-edge faculty research, like an artificial eye, to edgy student design projects, such as a life-sized robotic PAC-MAN game, SEAS will bring a bevy of the latest technologies across the Charles River. But one of the most innovative new additions may be the SEC building itself. The more than 500,000-square-foot, state-of-the-art space will contain classrooms, active learning labs, faculty labs, a makerspace, as well as a café, and plenty of room for community. With the building’s steel framework nearly complete, a one-of-a-kind energy conscious façade design will soon be added. 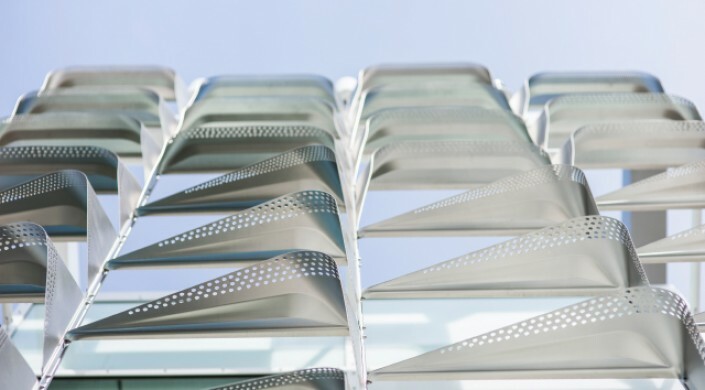 The distinctive metal skin that will envelope the upper floors of the SEC is engineered to minimize solar heat gain in warm weather months, capture thermal energy in cold weather months, and provide natural light and ventilation to the interior spaces. The custom panels will be positioned according to their orientation relative to the sun to optimize the massive building’s energy efficiency and thermal performance. On the two below-grade floors, transparent glass ribbons open toward the public courtyard, yet are shaded by projecting slab edges and light shelves that will reflect natural light deep into the interior of the building. The six above-grade floors, conceived as “research boxes,” will be covered in the innovative screening that, dependent on the angle of the sun, will shield the inside of the building from excess solar heat in the summer months, and let in excess sunlight during the winter months. Meanwhile, the central atrium and primary entry points of the complex contain large glass façades that bring in more natural light, yet are shaded by varied-height roof planes. All three outer façade systems include operable vents to support natural ventilation. In laboratory spaces, ventilation is often the most prominent energy consumer. Thus, to increase the complex’s energy efficiency, all outside air that enters the building runs through an air cascade that spans the entire complex, while exhaust air gets cycled through a heat-recovery system capturing waste heat to be recycled with more incoming fresh air. For the classroom and common spaces, a hydronic heating and cooling system will radiantly temper these spaces, minimizing the use of inefficient, fan-driven systems. The building’s grounds will be integrated with the Allston community by anchoring the Allston Greenway, a 10-acre park, while the complex itself will feature 70,000 square feet of public greenery, among other environmental considerations, making the SEC one of the most sustainable facilities of its kind. Behnisch Architekten is the architectural firm for the project.